June 13, 2018 Ginger C.
The uses of Infrared Thermal Imaging Technology in the world of equine can be very long and drawn out. I’m here to give the short and to the point version of how. Thermal cameras have been used with equine for many years now, by myself and a few others. The benefits that have come from thermal cameras are outstanding. I myself, am a farrier of 18 years and I use thermal cams in all of my daily practices. 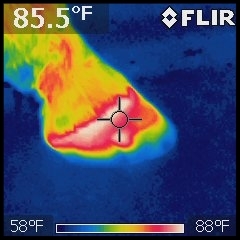 Being the owner of The Casey Horseshoeing School, in affiliation with the Farriers’ National Research Center, I also use thermal cams in the teaching process with my students. It has become so simple now to evaluate the horse with thermal tech that it is definitely a go to for me. The old saying is “no horse is trimmed or shod better than the human eye”. I say, why not make the human eye better. Taking half an hour evaluating the horse looking, poking and prodding is a thing of the past. Do I still examine how a horse moves and read the feeling in its face to see how much pain or discomfort it’s in? Of course, I do! I always make a visual determination about every horse I see but, with thermal tech the problems that a horse may have or not have, can be found to a precise point. Then the proper corrective procedures can be performed based on actual facts that can be seen, not a just a good educated guess. What do I mean by this you ask? For instance, your horse may develop an abscess, which is one of the most common lameness issues. I can determine exactly where the abscess is, pop the abscess to immediately relieve its discomfort and have the horse standing in comfort in a matter of a few minutes instead of spending more time searching for it by using basic hoof testers or other common tools. The use of thermal devices is NOT only limited to hoof lameness. As an equine professional, the most popular question I get is about movement problems and saddle fit. When a horse isn’t moving properly it is not always due to the feet. Just like so many of us humans that pull muscles or have soreness is our muscles, a horse can have the same. You work a horse every day for a week without the proper warm up and flexing period, it may pull a muscle in the shoulder, back or the hip just to name a few. A thermal scan can show exactly where the inflamed area is and then the proper recovery procedures can take place. So many problems I see in the horse being sore, is in the saddle. If your saddle doesn’t fit, you ARE going to have problems with that horse. A 200lb person on a horse with a poorly fit saddle is the same as a human carrying a poorly fit backpack, it’s going to cause soreness somewhere. Thermal scans of the back of the horse, after the saddle has been cinched and sat in will show precisely what pressure points are causing a movement issue in the horse. Thermal technology is not just a luxury for the high-end performance horse. In my opinion, it should be used on every single horse from the common trail horses to most prestige of show horses. If you consider your horse your friend or some even a family member, thermal tech will benefit them in every viable way in keeping them comfortable and living a long happy life. A Happy Horse = Happy Owner!